Ample storage is provided here in this trusty Amish Hardwood Mission Storage Bench. Our ever-popular Mission style furniture brings the beauty of solid hardwood in to enhance the look of the room while providing a functional piece of furniture that you can rely on. The list of possible places for this handy bench are endless! The foyer, hallway, bedroom, dining room, or kitchen can use a stylish bench to store cookbooks, toys, shoes, blankets, and other odds and ends! Available in Oak, Brown Maple, Cherry or Quarter Sawn White Oak, this Hardwood Mission Storage Bench combines the beauty of a simple design with solid construction that will function for years to come! 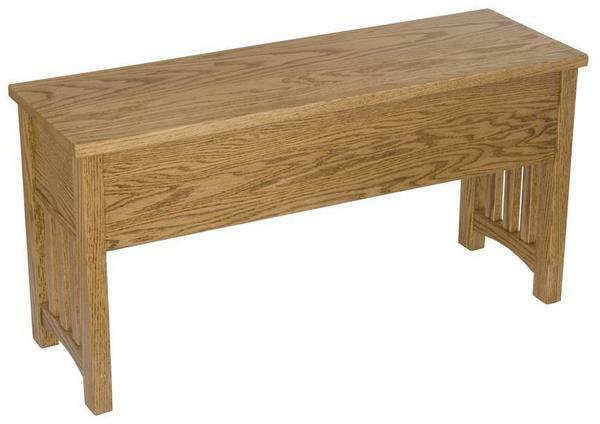 Consider our Amish Deluxe Arrow Back Windsor Bench for another option. 24" - 60" x 12" x 18.5"